Kim has been a member of Sweet Adelines International, a women's barbershop singing organization, since 1977. She was a member of the Sweet Adelines International Faculty, specializing in Vocal Production, and served on her own Region 7's music faculty. She also served as the Director Coordinator and Education Coordinator for Region 7. 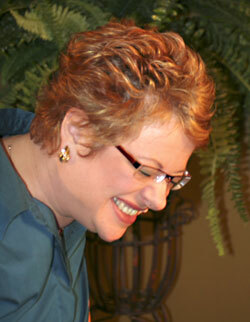 Kim began directing in the 1980's when she directed Northland Chorus in Kansas City. Soon after she decided to continue her education and began singing professionally. When she finally returned to directing it was in Mobile, Alabama where she directed Sound of the Bay Chorus. She then returned to Kansas City to co-direct the Kansas City Chorus but finally found her home directing RiverSong in St Joseph, Missouri. She now travels the world and is no longer directing, but is much sought after for coaching. Kim has also sung in numerous quartets at the international level since 1981 - Chord-On-Blues, Blue Revue, and PRIMO!. When she's not busy singing and teaching at home she teaches and coaches choruses and quartets around the world! Kim received her formal training at the University of Missouri at Kansas City's Conservatory of Music. She graduated with degrees in Music Education and Secondary Biology Education. She then began a Master's Program in Vocal Performance but became so busy singing opera professionally that she hasn't returned to her Master's degree program. Kim sang opera professionally for twelve years and continues to sing in the classical community today.